errands for her. It was three oclock when we got here. She sewed the carpet for the west room and I put it and the hall carpet down by five oclock. I took her home and unhitched Pet after I got back. Will came and we had supper. He helped me all evening put things to rights in Mr Edwards room. 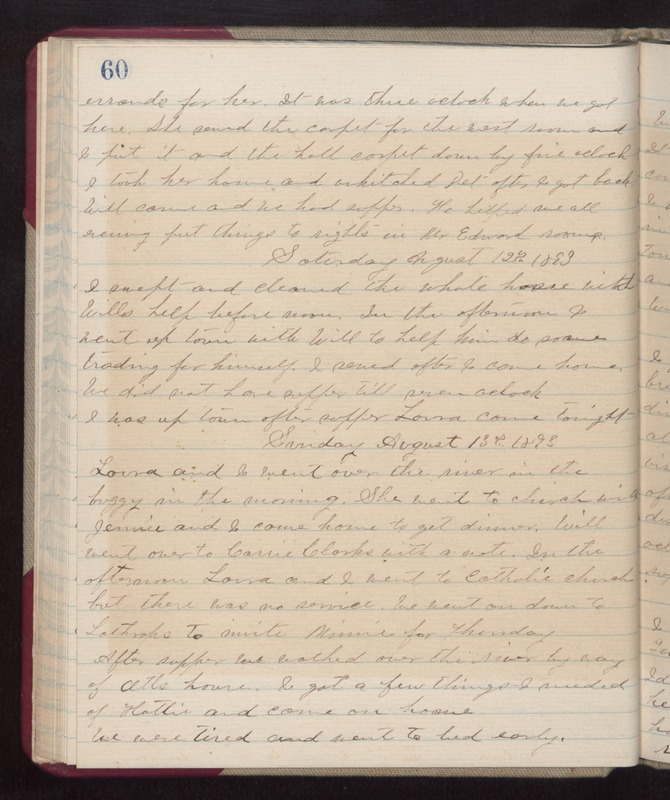 Saturday August 12th 1893 I swept and cleaned the whole house with Wills help before noon. In the afternoon I went up town with Will to help him do some trading for himself. I sewed after I come home. We did not have supper till seven oclock. I was up town after supper. Laura came tonight. Sunday August 13th 1893 Laura and I went over the river in the buggy in the morning. She went to church with Jennie and I came home to get dinner. Will went over to Carrie Clarks with a note. In the afternoon Laura and I went to Catholic church but there was no service. We went on down to Lathrops to invite Minnie for Thursday. After supper we walked over the river by way of Otts house. I got a few things I needed of Hattie and came on home. We were tired and went to bed early.